The 0.17 ohm V12-T6 sextuple replacement coil heads are a prime example of SMOK’s most remarkable technology, utilizing a patented sextuple coil design to climb to wattages in excess of 240W with ease. These impressive coils heads contain three vertically aligned dual-parallel coils and are wicked with pure japanese organic cotton. 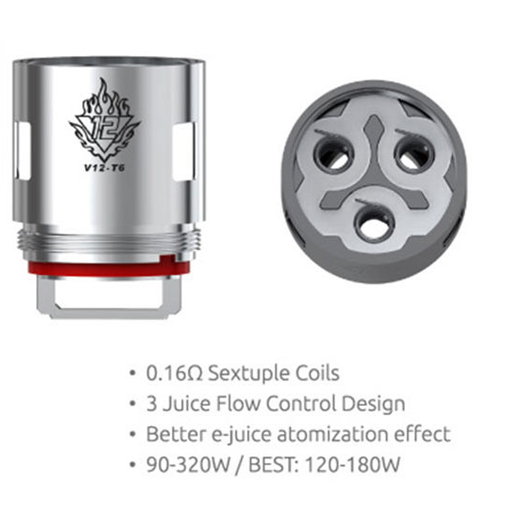 The V12-T6 coil heads are also constructed out of stainless steel and offer three enormous wicking ports to keep the cotton juiced and ready to go. For "deep and rich cloud flavor"
Made from stainless steel, wicked with pure japanese organic cotton, features enormous wicking channels, and is designed with a resistance of 0.12 ohms within a duodenary (twelve of ‘em!) core cylinder to provide a superior amount of vapor production and the ability to fire up to an astounding 350W. SMOK's V12-T12 coil head successfully redefines the possibilities of what today's sub-ohm tank systems are capable of.